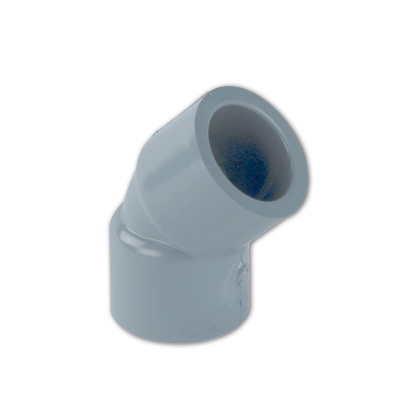 2-1/2" Light Gray Schedule 80 CPVC 45° Socket Elbow | U.S. Plastic Corp.
CPVC is light, flexible, tough and provides exceptional corrosion resistance. Because of these and other propertiesof a high quality engineered thermoplastic, the savings that can be realized in initial installation and continuingmaintenance costs are substantial. CPVC handles temperatures up to 210°F. Highly resistant to acids,alkalis, alcohols and many other corrosive materials. Ideal for process piping installation and most service pipingapplications. Will not rust, scale, pit or corrode, nor are they subject to electrolysis. For buried applications,CPVC is not affected by soil conditions or galvanic corrosion. Painting is not required for indoor non-exposedinstallations. For outdoor installation where the piping may be exposed to significant sunlight, we recommendpainting; two coats of a white or light-colored, water-base, outdoor latex paint provides added protection. NotU.V. stabilized. NSF 61 listed.